Named after Colonel Stephenson Hamilton, who was instrumental in establishing the world famous Kruger National Park, Hamilton’s Tented Camp reflects a safari adventure of the early twentieth century, where grace and style were the epitome luxurious living. Rediscover an era where the only thing more than the creatures, were the creature comforts. Historically themed along the lines of a big game hunter’s camp encompassing the bygone era of the early 1900’s, Hamiltons Tented Camp allows indulgence in pure luxury, combined with the sounds and smells of the African bush. 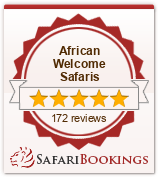 Why choose Hamiltons Tented Camp? Join your guide on a one and a half hour walk in our Private Concession and get to know the smaller intricacies of nature. Here you will be able to smell, touch and feel the natural surroundings you have travelled so far for. Your guide will spend time teaching you more about the tracks and signs of the bush as well as about the smaller animals often overlooked in pursuit of the Big Five. Participants must wear flat soled closed shoes. (No high heels, flops or sandals) Neutral coloured clothing to be worn. No strong perfume/cologne to be worn. Persons older than 65 years to provide a letter from their physician that they are medically fit enough to partake in this activity. Persons also needs to be fully conversant in the English language to understand instructions in dangerous situations.